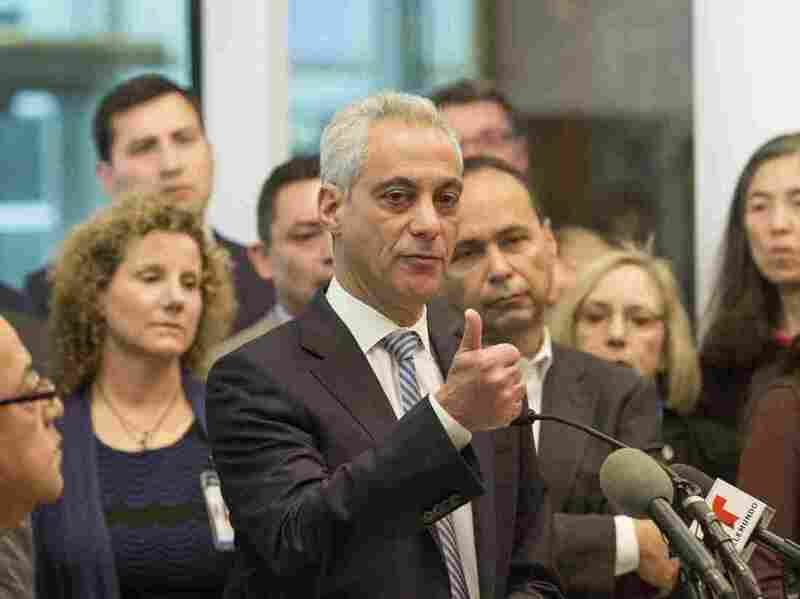 Mayor Rahm Emanuel: 'Chicago Always Will Be A Sanctuary City' : The Two-Way Seeking to reduce the fears of immigrants living in the U.S. illegally, Emanuel said he would not change the city's policy even if it means losing all federal funding. Chicago Mayor Rahm Emanuel added his voice to the chorus of big-city mayors who say theirs will remain "sanctuary cities" in response to President-elect Donald Trump's hard-line positions on illegal immigration. Surrounded by immigration activists, business leaders and state and federal lawmakers, Emanuel sought to reduce the fear of immigrants living in this country without authorization. "To all those who are, after Tuesday's election, very nervous and filled with anxiety ... you are safe in Chicago, you are secure in Chicago and you are supported in Chicago," said Emanuel at a news conference called to publicize the expansion of mental health services for people anxious over the election results. "Chicago has in the past been a sanctuary city. ... It always will be a sanctuary city," the mayor said. His comments come on the heels of Trump's appearance Sunday on CBS's 60 Minutes, in which the president-elect promised to deport all immigrants with criminal records. "What we are going to do is get the people that are criminal and have criminal records, gang members, drug dealers, where a lot of these people, probably 2 million, it could be even 3 million, we are getting them out of our country or we are going to incarcerate," said Trump. Trump did not mention sanctuary cities — jurisdictions that have policies of not cooperating with federal immigration authorities. But his "First 100 Days" plan includes cutting off all federal funding to sanctuary cities. Emanuel joins the mayors of New York, Los Angeles, San Francisco, Seattle, Philadelphia and others who all have said their sanctuary city policies will remain in place despite the threat of losing federal assistance. About 300 cities and counties across the country have such a policy. The loss of federal funding could be staggering. In the case of San Francisco, for example, city officials say they receive about $1 billion from Washington. City leaders and local police in many jurisdictions say that immigrants are more likely to cooperate with police when they don't feel the threat of deportation if they report a crime.